Hi, I’m Amanda. Welcome to Designs on You. As you can see, I don’t have many ready-to-wear outfits for sale yet. Although I’m expanding my prête-a-porter line, my main concentration is creating special, customized pieces. Wait…what? You can see Max? That’s unusual. So far, the only people I’m aware of who can see her are my grandfather and me. Not even Sabine, the psychic, could see Max. Anyway, I’m impressed that you can see her and that you aren’t freaked by her presence. Max had that same effect on Grandpa Dave and me. We’ve always felt at ease with her. Well, until she says or does something that causes you to embarrass yourself. Like this one time, I was changing clothes in here, and…well…I’ll let you read it for yourself. “All right. That one it is.” I took the dress off the form and went behind the screen to change. “I need help with these buttons,” Max said. “I need help with these buttons?” I echoed. “Sure, no problem.” Jason stepped around the screen and began unfastening the pearl buttons. My eyes flew to Max, who was laughing and clapping her hands. Max gave me two thumbs up, and my eyes widened when I realized how that must have sounded. So, you see, it can get a little weird having a friend around that no one else can see. How about you? Who’s the oddest friend you’ve ever had? Thank you for hosting me on your beautiful blog today! 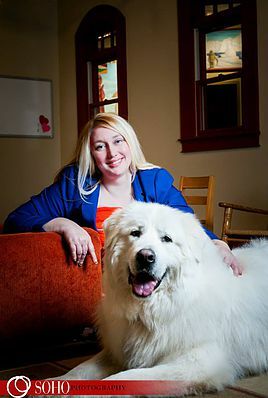 I’m looking forward to meeting Amanda (& Max). 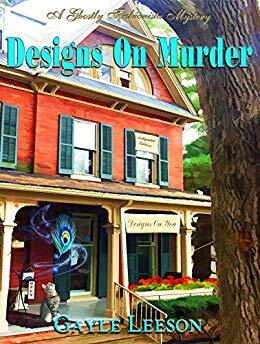 Thank you for being part of the book tour for “Designs On Murder’ by Gayle Leeson. Enjoyed hearing from Amanda and would love the opportunity to read more about her by the opportunity to read this book. I would love to read. Sounds like a great cozy mystery!